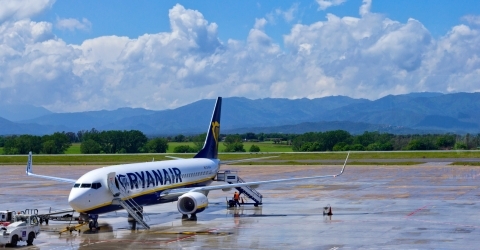 Essentially, mostly Ryanair flies to the Girona - Costa Brava airport, which is about 75 kilometers northeast of Barcelona. From Germany to Girona Ryanair flies from Bremen, Münster/Osnabrück, Dortmund, Düsseldorf/Weeze, Cologne, Frankfurt-Hahn, Karlsruhe and Memmingen. There is currently no connections from Switzerland to Girona. Greater Vienna is served by the Slovakian airport Bratislava / Vienna. The routes can change depending on the season. From Belgium Ryanair flies from Brussels (Charleroi), in Holland from Eindhoven, Groningen and Maastricht / Aachen. From Denmark, Billund and Aarhus are starting points to Girona. On this page we will describe how to get to Barcelona from Girona Airport. A private transfer from Girona by taxi, people carrier or bus is certainly the most comfortable way of getting there: our driver welcomes you in the arrivals hall, you do not have to buy tickets anymore, the car is waiting outside the arrivals hall and you will be taken directly to your hotel or desired destination. It could not be more comfortable. Here you can book the private transfer and departure transfer from Girona to Barcelona. Official vehicles with "SP" marking. Our modern and comfortable vehicles comply with the legal requirements. People carrier: very comfortable vehicle up to 6 passengers. Luggage in the trunk. To make your reservation simply select the desired vehicle, indicate the date and the scheduled time of arrival of the airplane and then click on "Add to cart". Our driver will wait for you in the arrivals hall with a name tag. You can determine what should be on the sign. The shuttle bus that connects Girona Airport with the city of Barcelona drives without stopping to the central bus station of Estació del Nord. From the arrival hall, you do not have to go far to reach the bus stop: after leaving the security area, you go out onto the road, then immediately right and in about 100 metres you will see the bus stops. The bus to Barcelona waits just behind the ticket booth, where you can buy your ticket. One-way ticket costs €16, the return ticket costs €25. We recommend that you buy a roundtrip ticket. On the one hand it's cheaper than two single tickets, and on the other hand the ticket sales office for the return trip at Estació del Nord only opens at 06.00, so you may not be able to get a ticket if you have to leave early. The drivers do not sell tickets! The buses run according to a timetable that matches Ryanair’s flight schedule, so you do not have to worry about being able to catch the bus on time. You will have enough time to collect your luggage and buy your bus ticket. There are free schedules available from the ticket booths. Take one with you is that you have the timetable for your return trip. The Bus Schedule can be downloaded as a PDF file from the Bus Company’s web site. You are not permitted to take your bags into the passenger compartment, except for hand luggage. Before boarding you can store your luggage in the luggage compartment on the side of the bus. The approximately 70-minute bus tour ends at Estació del Nord, specifically Parking Spot No. 7 directly in front of the Tourist Information Office. If you have pre-booked a Barcelona Card you can pick it up here and continue travelling with the Metro for free. Note for the return trip: the shuttle bus to Girona airport will leave from the other side of the car park at Parking Spot No. 28 and 29. If you need a return ticket, you can get it at a counter on the first floor of the building. Another hint for the return trip: on the return trip from Barcelona to the airport the bus stops right outside the departure hall of the terminal building. With the Barcelona Card and the Hola BCN ticket you have free travel on the metro and the trains in the city area. The "Arc de Triomf" subway station is in the immediate vicinity of the bus station, and from here you can easily travel with the Underground or train. To get to the Metro station you should walk along the right side of the bus station building and through the gate along the fence at Parking Spot No. 15, this leads to the stairs up to the road. The entrance to the Metro station is located on the street. Tickets are available from vending machines at the entrances. Note: In the Metro station you can also take underground trains and regional trains. You can use all of these trains with the same ticket. There is no train station at Girona airport. If you would like to take the train to Barcelona, you would need to take a time-consuming detour via Gironain. Therefore you have to travel by bus to Gerona Central Station, and from there take the train to the city of Barcelona. You can find the timetable directly online on the RENFE web site. This takes much longer and is not adjusted to the arrival and departure times. We do not recommend this variant of arrival, unless you want to make a detour to Girona to visit the very beautiful medieval city. Directly from the airport, you can also easily continue your journey by rental car. You can then keep the car for the entirety of your stay, or return it in Barcelona. For small groups up to five people and a lot of luggage this is quite a comfortable and usually not too expensive alternative to bus or taxi. Only the search for parking in barcelona is a disadvantage, as long as you have no parking spot in your hotel. If you need a car park at any destination during your trip you can search and book a parking slot in advance on Parclick. Some car rental stations are located in the arrivals hall, and others in the car park of the car reantal companies (from the arrivals hall to the left, about 300-400 meters). The places on the Costa Brava, e.g. Lloret de Mar, are easy to reach and well signposted. By taxi, you have officially fixed prices if you start from a taxi at Girona Airport. The following prices apply: to Girona: €22, Platja D'Aro: €46, Lloret de Mar: €46, Roses: €92, Barcelona: €120. At night and on weekends prices can be slightly higher. Taxi ranks are located outside the terminal, but especially in the off-season taxis are not available. From Girona Airport buses also travel to other towns on the Costa Brava, such as Girona, Blanes, Lloret de Mar, Malgrat de Mar, Manresa, Santa Susanna, Tossa de Mar, Figueres and others. As described above, you can purchase your ticket at the ticket booth in front of the bus car park. The Schedules and Prices of Bus Services to the Costa Brava can be downloaded from the Segalés Bus Company’s web site. Private transfer from Girona airport directly to your hotel in Barcelona for a fixed price. No matter how many people drive in the vehicle. Please indicate the date and time of the scheduled arrival of your airplane. Then select the vehicle you want to book. Private transfer from your hotel in Barcelona to Girona Airport for a fixed price. No matter how many people drive in the vehicle. If you require more than one vehicle, please carry out the booking again. Please enter the date and time at which we should pick you up. Please consider a travel time of approx. 90 minutes and the time for check-in and for security checks. Expected number of people. Note the maximum number of the vehicle.